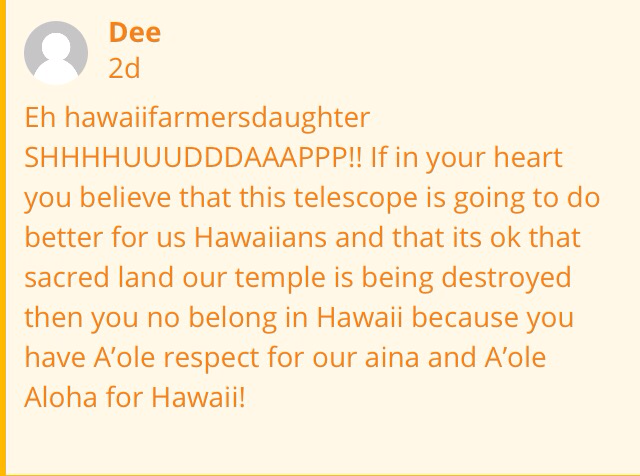 Just a few days ago, people were sharing some really ugly threatening comments from a TMT protester full of f-bombs galore. These comments eventually made it back to this person and became a center of Ian Lind’s blog post. The sad thing about all of this is that when people can resort to this kind of behavior, it really shows that they are not capable of considering the consequences of their actions. That is a real problem that they don’t even realize. In the social media world, delete is an option but once you put your name to a comment, you’ve owned it. Make a threat or nasty comment and it’s there for all eternity thanks to screenshots. If someone should see it, it’s public information and can turn viral. It’s the kind of publicity can doom your future career and reputation. Here’s some lovely comments I’ve received through this blog from these hobby activists, a term that my social media friend, Chuck Lasker, coined. It is sad that some think that the land comes before people. When a lot of Hawaiians are imprisoned or homeless, or leaving because of the lack of opportunities, what good is it? It is hard to believe that people can speak out without being paid. The easiest way to dismiss someone who disagrees with them is to do the shill accusation bit. This woman is supposedly a science teacher so she has claimed. I’d be afraid of her teaching my kid science. 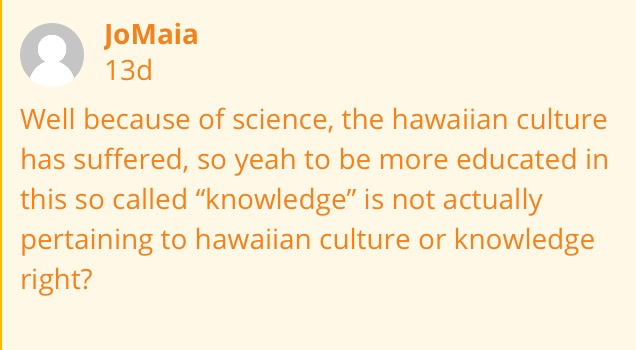 Science has made the Hawaiians suffer? I have a hard time believing it when the Merrie Monarch Festival can be broadcasted around the world to show the beauty of this culture. The internet has also captured stories of the kupuna to show future generations their stories. Hobby activism only fuels more protests but no real solutions or options. What alternative will these people provide should they get what they want? The anonymity of the social media also encourages more hateful speech. How productive is that in all of this? An anonymous poster who decided to visit my FB page who clearly is there for anything but discussion. 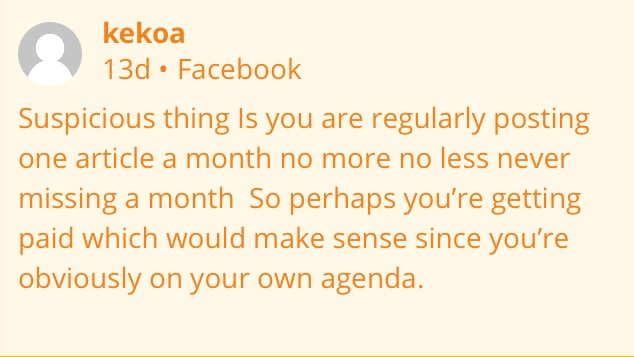 Here’s the worst comment I have received on the blog that really shows the mentality of the protesters. Given these comments, it really starts to reflect the kind of mentality of the people behind this movement. They aren’t well informed about the process that led to the approval of the TMT and can’t fathom the repercussions of them blocking it at this point in time. They also do not realize that these will reflect upon others involved in the movement too. They clearly cannot see the consequences of their decision to post these kinds of commentary. Should we really be listening to those who haven’t throughly thought out about the issue? 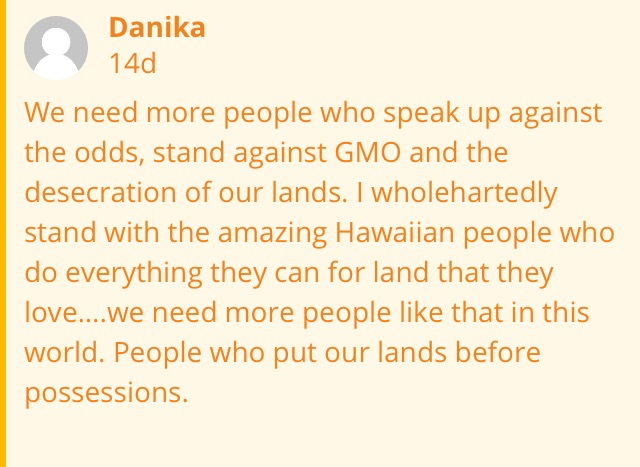 Are these the kind of people that should be making these kinds of policies for the future of Hawaii? Once again, I feel it’s time we need to really look back upon our local roots. Many people came to our islands to work on those plantations. It took a lot of cooperation and collaboration working with people from around the world. Everyone learned from each other and we got our local style that made Hawaii the special place we all know and long for. Where is that being fostered in Hawaii’s communities? Whether it be the GMO issue or the TMT one, that local style is eroding away bit by bit. What’s missing here is strong leadership with a real vision to inspire us to be contributors to the Hawaii we all want for our future. I believe that there is a way to find common ground with maintaining the sacred symbolism of Mauna Kea with the need for advancing our quest for knowledge. There is a faction who refuses any concessions and are unwilling to accept the long term impacts to the community as a whole. When we look into they eyes of the keiki, what do we want for them? Do we want another generation of protesters or can we see beyond that? The human spirit has an innate desire to progress and move forward. We all have that desire to do things better. The attempt to stymie that has led to wars instead of peace. The right decision may not be the most popular one but our leaders have an obligation to stick with that vision and do the hard task will keep us on track. 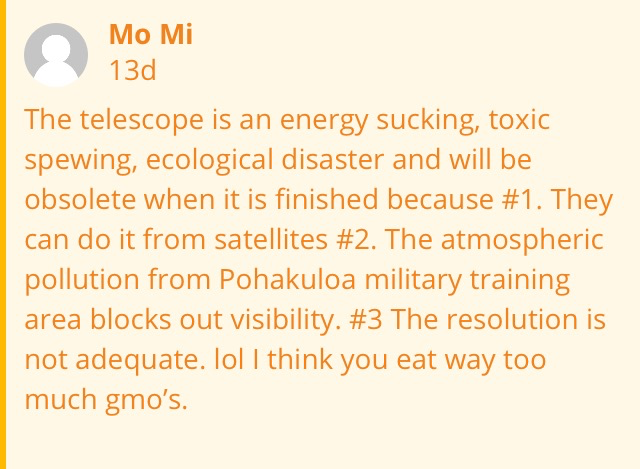 This entry was posted in Uncategorized and tagged anti-GMO, environmentalist, green blob, thirty meter telescope. Bookmark the permalink. Hi Joanie, your comment about these posted statements haunting and hampering the ability of those who make them to advance in life is a point well taken. We had an employee at our farm that made similar comments on his Facebook page. Unfortunately it was spotted by another employee and reported and the offender was immediately fired! I just don’t understand how people can make these statements and not expect some consequences, especially in a world where the written word can travel across the planet in the blinking of an eye! Thank you for having the courage to stand up to this kind of abuse. I suspect that there may come a time, in the future, when this kind of menacing and degrading commentary will be addressed statutorily. I certainly would not like to see that happen but if the wrong person is offended it could take on a life of its own. It is way better if we self-police but the way things are going someone is, eventually, going to say “There ought to be a law!”. Keep up the good fight! Thanks John for your comment. I just can’t sit back and ignore this ugliness any more. Things don’t have to be like this and people need to realize there are consequences.